Enrich your life as you enrich the lives of others – volunteer! 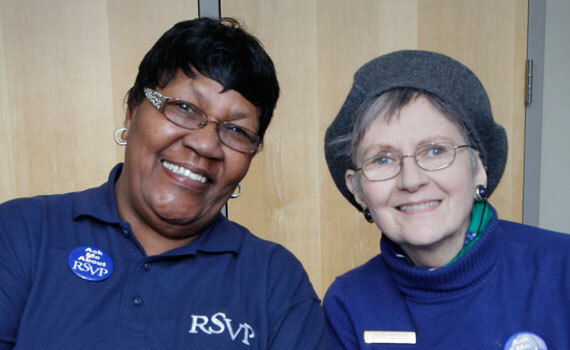 Solid Ground is a proud sponsor of RSVP, one of the largest senior volunteer networks in the nation. We are a federally funded, National Service program open to anyone 55 and older who wants to make a difference. Join us and more than 700 volunteers across King County to address critical community needs by volunteering with one or more of our 50+ nonprofit partners. Calling Volunteer Home Helpers 55 & Older! Cancer Resource Center: Seeking volunteers to make a difference in the lives of those fighting cancer. Assist patients in finding resources directly in the hospitals where they are being treated, and link them to support services and community resources. Help save lives by fulfilling yours. Training is provided, so no prior experience is required. Road to Recovery: Seeking volunteers for this essential program. Join a group of volunteers who drive cancer patients to and from medical facilities for life-saving treatments. The schedules are flexible. If you have a car and can spare as little as one morning or afternoon a month to help somebody along the Road to Recovery, they would welcome your help. Associated Recreation Council (ARC): In partnership with the Seattle Parks Department, ARC offers afterschool arts and STEM classes to K-8 students at 26 schools in the Seattle School District. Volunteer assistants are needed to help instructors prepare for their classes, support children in the classes, and help with cleanup. Expend some energy and join the fun by volunteering for a shift. Bailey-Boushay House serves people with HIV/AIDs as well as those who need end-of-life care with conditions including cancer, ALS, and Huntington’s Disease, among others. Volunteers are the heart of Bailey-Boushay House, increasing quality of life for those living on the margins. Be a vital part of the agency! Opportunities include: ⇒Provide one-to-one companionship. ⇒Assist with community meals, outings, activities and escorts to medical appointments. ⇒Assist at the front desk. Bloodworks Northwest: Become part of the lifesaving link that delivers blood to patients in need in your community. Many opportunities are available depending on whether you prefer to be a donor monitor (helping certain donors feel well after donating) or work at the front desk (greeting and registering donors in the computer system). Volunteers are especially needed M-F during the day to go into the community to help at blood drives. Bureau of Fearless Ideas: From tutoring students of various ages in differing subjects, to helping them in the creation of songs, assisting in writing stories and publishing books, hosting classes for field trips and working in Seattle schools, volunteers do it all. Whatever your talent is, the Bureau can find a use for it. There are a variety of commitment levels and ways to help, so consider committing and volunteer now. Cancer Lifeline: Volunteer from your home or at the call center! Lifeline provides emotional support and resource referrals for all people living with cancer: patients, survivors, friends, family members, caregivers and coworkers. You should be comfortable listening to profound emotions, be a good listener, and be able to provide nonjudgmental support. If volunteering from home, you must have phone and Internet access. 20 hours of training provided. There are also opportunities to assist with administrative tasks, fundraising, committees, mailings and events. Catholic Community Services (CCS) – Volunteer Services welcomes volunteers to enable elders living on low incomes and adults with disabilities to remain independent in their own homes. Volunteers may help the same person or be listed for on-call opportunities depending on their schedule and interests. Volunteers receive training, mileage reimbursement and insurance. Requests include: ⇒transportation, ⇒chores, ⇒laundry, ⇒cooking, ⇒yardwork and ⇒office work. Circle of Friends for Mental Health: This wonderful group works to improve the lives of people with pervasive mental illness through classes and community outreach programs. Share your skills as a class leader or assistant leader, or help provide administrative assistance. Classes are offered at several facilities in Central and North Seattle; training is provided. FareStart helps people experiencing poverty escape the cycle they are in by teaching them the work and life skills they need to succeed in the food service industry – and in life. Be a part of the kitchen prep team working alongside FareStart’s chefs and students to prepare meals for homeless shelters and for students in schools. You will learn more than you ever thought possible about cutting food of all sorts and food preparation! A great hands-on opportunity! Financial Beginnings: This volunteer driven, community-oriented organization utilizes trained volunteers to teach students elementary through high school age and young adults the basics of banking, budgeting, investing, credit and risk management. Teaching opportunities in the classroom and the community include presenting programming in a group setting and/or as a financial coach providing one-on-one support. Take the time to find out more and turn your compassion to action. Activities: Assist or lead a variety of fun activities for frail elders and people with disabilities. Help them maintain an independent and dignified lifestyle by enhancing their physical, social and cognitive functioning. Volunteers needed between 9am-2pm, Monday-Friday, or anywhere in between. ElderFriends: Make regular visits with an isolated older adult 2-3 times a month. Spend time with them cooking, talking, taking walks, or going to appointments or the movies. Training and ongoing education and support for volunteers provided. Habitat for Humanity seeks regular volunteers to help build and repair homes for hardworking families in King County. Volunteers also coach families in Habitat’s Family Support program, help host volunteer groups, and get the word out through community outreach programs and events. They have over 30 volunteer roles! Join them for a volunteer orientation session to learn more. Jewish Family Services helps vulnerable individuals and families in the Puget Sound region achieve well-being, health and stability. Volunteer opportunities include: ⇒food bank shifts, ⇒food bank home delivery, ⇒friendly visitors for older adults and people with disabilities, ⇒making and delivering holiday gift baskets, and ⇒supporting resettled refugees. Keiro Northwest provides health and related services in a traditional atmosphere to primarily Japanese American families in the Pacific Northwest. Like to talk? Play games? Asian seniors need your warm touch. If you speak any Asian languages, it’s a plus, but not a requirement. Whenever you have the time, your help will be greatly appreciated. Volunteers are needed for companionship and activities in: ⇒the adult day center, ⇒assisted living facilities, and ⇒skilled nursing homes in both Seattle and Bellevue. King County Sexual Assault Resource Center (KCSARC) – CourtWatch: Interested in learning more about the criminal justice system? Would you like to help improve this process for victims of sexual assault and abuse? CourtWatch is recruiting volunteers to serve as court monitors who sit in on court cases, take notes, and report back about what they observe. Positions are available at the King County Superior Courthouse in Seattle and the Maleng Regional Justice Center in Kent. Lifelong: For more than 30 years, Lifelong’s volunteers, who are the heart and soul of the organization, have played a vital role in helping provide quality care and services to clients. Volunteer opportunities include: ⇒repacking food donations, ⇒prepping food, ⇒packaging meals, ⇒delivering nutritious food, ⇒assembling health care kits, ⇒administrative projects, ⇒thrift store assistance, and ⇒lending a hand at events. Museum of Pop Culture (“Mo Pop“) is a leading-edge nonprofit museum, dedicated to the ideas and risk-taking that fuel contemporary pop culture educational programs. Be a part of its community of passionate volunteers by enhancing the guest experience while extending the reach of staff. Share your enthusiasm for pop culture with visitors through exhibit interpretation, information desk attending, interactive support, event assistance, and much more. Pacific Science Center: Do you have a lively curiosity and love science and math? The Pacific Science Center seeks you to volunteer to inspire lifelong learning in science, math and technology with guests, both young and old. They have many opportunities – from horticulture, to science interpretation, to their maker space – including roles as Guest Ambassador, Animal Care, Horticulture Exhibit and Science Interpretation Program Volunteer. Puget Sound Labor Agency (PSLA): Make a positive impact on those experiencing poverty and living in downtown Seattle by volunteering with the PSLA Food Bank at the historic Labor Temple in Belltown. Volunteers are needed for data entry, delivery pick-up, driver, food distribution, customer greeter and food bank journalist. Volunteer shifts vary from 2-4 hours in length. RAMP program: Opportunities are available for retired builders to help wheelchair users access their homes through PSLA’s RAMP program. Reading Partners: A literacy nonprofit that mobilizes community volunteers to provide one-on-one tutoring to struggling elementary school readers seeks tutors for one hour a week during the school year. No experience required as you are provided with an easy-to-follow curriculum that includes all the materials to teach an effective lesson. A staff Site Coordinator is available to support tutors at all times. Seattle Cancer Care Alliance volunteers provide practical, social and emotional support to patients undergoing cancer treatment and their families. Their many volunteer services include: ⇒provide airport transportation, ⇒serve in the gift shop, ⇒host monthly social events for patients (crafting, knitting, games etc. ), and ⇒provide assistance with special projects. Seattle Goodwill relies on skilled and dedicated volunteers to achieve their mission of changing lives through jobs. The many ways to volunteer include: ⇒support students in job training and education programs, ⇒assist administration and support services departments with important projects, and ⇒bring their vintage fashion collection and special events to life. Solid Ground: Sponsor of RSVP in King County, Solid Ground works to end poverty and undo racism and other oppressions that are root causes of poverty by providing housing, food, transportation and other services to those in need across King County. Volunteer positions are open in many of the programs we administer, including: ⇒nutrition education, ⇒tutoring, ⇒helping at a community farm and ⇒supporting outreach efforts. Broadview Emergency Shelter: Broadview provides both emergency shelter and transitional housing for women and their children who are domestic violence survivors. Volunteer opportunities are flexible, occur mostly in the afternoons and evenings, and include: ⇒one-to-one tutoring for children and adults, ⇒childcare, providing a safe supervised space for children while their mothers attend on site groups or meetings, ⇒administrative support such as data entry, organization and other administrative tasks in an office environment. Community Food Education (CFE): This program is designed to teach people living on low incomes how to prepare healthy and delicious meals on a limited budget. If you are passionate about food, CFE is looking for volunteers for 6-week class series. Work alongside a staff coordinator to facilitate fun, lively and informative classes. Volunteers work with the participants on educational activities and help them prepare a shared meal. Classes are held at community organizations, public and transitional housing sites, schools, and other service-providing agencies throughout the Seattle area. Training is provided. Sound Generations of Seattle-King County: Help Sound Generations senior centers throughout King County. Senior Meals Volunteers help in the community dining programs. Volunteers are needed to: ⇒prepare and set tables for lunch, ⇒assist in food preparation, ⇒serve lunch to guests, and ⇒clear dishes/assist with clean up. Meals on Wheels Drivers deliver meals within a designated route. Information & Assistance and Transportation Services Volunteers are also needed in at the Seattle office location. United Way Free Tax Prep: Join the Free Tax Campaign, a program that helps struggling families and individuals prepare their taxes, gives access to savings and opportunities, and connects them to public benefits. No tax experience necessary – they will train you. Join a talented team and help reach the people who need it most. Signups begin in October. Volunteer Drivers take veterans to appointments. Frontline Customer Service Volunteers are friendly people who help visitors navigate the medical center. Be the one there with a friendly face! Wellspring Family Services – Baby Boutique: Serving families with children 0-17 years of age who are experiencing homelessness and poverty, Baby Boutique provides free children’s items (new and gently used) such as clothing, diapers, formula and other essential items for infants, multicultural learning toys and books, and baby gear and equipment. The Baby Boutique has monthly volunteer opportunities on the 3rd Saturday of each month from 9:30-11:30am. Youth Tutoring Program (YTP) provides free one-to-one tutoring for children living in six different housing communities for those living on low incomes around Seattle. YTP students represent many nationalities, cultures, languages and religions. Volunteers meet with the same student every week to mentor and tutor them in the skills they need to thrive academically and in life. Afternoon and evening hours are available; sign up for one hour a week or more and help a child succeed. YWCA works to eliminate racism and empower women. They have a variety of one-time and ongoing volunteer opportunities during weekdays. Opportunities include: ⇒Angeline’s breakfast and lunch service, ⇒front desk volunteers at multiple sites, ⇒Central Area food bank on Wednesdays, ⇒clothing donation sorters in Seattle, and ⇒working wardrobe volunteers on the Eastside. Sharing your skills and time is rewarding; consider volunteering for the YWCA today. American Cancer Society – Road to Recovery: Seeking volunteers for this essential program. Join a group of volunteers who drive cancer patients to and from medical facilities for life-saving treatments. The schedules are flexible. If you have a car and can spare as little as one morning or afternoon a month to help somebody along the Road to Recovery, they would welcome your help. FamilyWorks Resource Center & Food Banks help families in need of resources, support and community. They are looking for volunteers to: ⇒be reading buddies and participate in literacy activities together with children 5-12 years old, ⇒assist with fundraising and family programs, and ⇒help out in the Resource Center with special projects, events, mailings and at the resource desk, ⇒help at their food banks, and ⇒participate in supermarket food drives. Greenwood Senior Center provides vital services as well as social, physical, and educational activities for senior citizens and neighbors in the surrounding community. The center offers opportunities for growth for all participants and works in partnership with the neighborhood to enrich the lives of all who come into contact with them. Volunteers are needed in a variety of capacities ranging from community dining to transportation. New Beginnings Community Advocacy Program Helpline: Be a critical link in helping domestic violence survivors seek safety and find the services they need to move forward. Some ways you can empower survivors as a volunteer: ⇒work on the Helpline, ⇒provide childcare, or ⇒help in the legal clinic. You can also work alongside New Beginnings to end domestic violence: ⇒bring awareness through events and outreach opportunities, or ⇒facilitate conversations on healthy relationships to educate about prevention. North Helpline Emergency Services & Food Bank: There are many opportunities for volunteers to help in the foodbank with sorting and food distribution. Assist with client check-in, line direction, assisting customers with carts, and stocking and distributing food. Help with the sorting process by bagging fruits, vegetables, and bulk items like rice, dog food and potatoes. Street Youth Ministries (SYM): Can you donate your time? Join SYM’s volunteer crew! Come serve and build relationships with street youth at their drop-in center. Assist youth with check in, showering and laundry procedures as they arrive at the center. At mealtime, be available to serve food. Join and facilitate the activity of the evening encouraging youth to become engaged as they develop social and behavioral skills. University District Food Bank seeks volunteers to help fight hunger in northeast Seattle. There are many ways to help out: ⇒volunteer in the grocery-store style walk-in food bank, ⇒deliver food to homebound folks, ⇒assist with the brand new rooftop farm, and much more! Volunteers like you power the U. District Food Bank, and they would love for you to join their team! Food Lifeline: Be one of more than 10,000 people lending a hand to help stop hunger. Food Lifeline is in great need of volunteer assistance to sort and pack donated produce and food. Each day they receive 25,000 pounds of donated food, which is sorted by volunteers and then distributed to 275 food banks and meal programs in western Washington. They have opportunities to fit every schedule. Your time and energy will make a difference. International Drop-In Center (IDIC): The IDIC is committed to assisting the elders of Seattle’s Filipino community in preserving their physical, mental and emotional well-being through a variety of social, recreational, educational and health-oriented programs. Volunteers are needed for food distribution and fundraising activities. Wellspring Family Services – Baby Boutique: Serving families with children 0-17 years of age who are experiencing homelessness and poverty, Baby Boutique provides free children’s items (new and gently used) such as clothing, diapers, formula and other essential items for infants, multicultural learning toys and books, and baby gear and equipment. The Baby Boutique has monthly volunteer opportunities on the 3rdSaturday of each month from 9:30-11:30am. Full Life Care – ElderFriends: Make regular visits with an isolated older adult 2-3 times a month. Spend time with them cooking, talking, taking walks, or going to appointments or the movies. Training and ongoing education and support for volunteers provided. Hopelink serves people living on low incomes and those experiencing homelessness, promoting self-sufficiency for all members of the community. Daytime and evening hours are available at Bellevue, Kirkland, Northshore, Redmond, Shoreline and Sno-Valley locations. Volunteer opportunities include: ⇒GED tutors, ⇒English as a Second Language teachers, ⇒nutrition/cooking teachers, ⇒computer teachers, ⇒tutors for reading, writing and math, ⇒volunteer buddies and ⇒food distributors. Mercer Island Parks & Recreation Community Center – Senior Social addresses the needs of senior adults who have physical, memory, hearing or vision limitations. This social recreation program provides physical and mental activities, music, arts/crafts, dance, exercise, guest speakers and educators. Volunteers work directly with senior participants and help organize and facilitate daily activities and room set up. Bus helpers and drivers (no CDL) also needed. 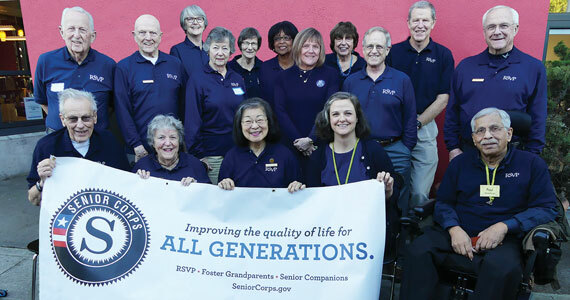 Mount Si Senior Center (North Bend) desires to enhance the quality of life for older adults in the Snoqualmie Valley by providing a comprehensive network of services including health, social, recreational and educational programs, housing, and transportation. They are always looking for kitchen, community dining and thrift store volunteers. North Bellevue Community Center is a major focal point for a comprehensive array of senior programs and services. These include: ⇒health and wellness, ⇒cultural and performing arts, ⇒human services, ⇒drop-in activities, ⇒socialization, ⇒information and referrals, ⇒community dining and trips. The community center works in conjunction with senior members of the community to maintain their independence, health and sense of well-being by providing support, referrals, activities and learning opportunities. Stop by for a tour and let them show you the wide range of volunteer opportunities available! Northshore Senior Center is the place to go if you love meeting new people and making lasting friendships. The center promotes healthy aging and well-being in the community through their programs, services, resources and civic engagement. They need volunteers for their: ⇒community dining and Meals on Wheels programs, ⇒adult day center, ⇒fitness program, ⇒computer lab, ⇒special fundraising events and ⇒other support services. Northwest Parkinson’s Foundation (NWPF): Help bridge the gap between diagnosis and the cure for Parkinson’s disease! NWPF provides programming, information and support for people living with Parkinson’s and their loved ones. Volunteer opportunities range from event help to office assistance. They’re seeking volunteers with an empathetic heart and a can-do attitude. Join them at an event for the day or around the office on a regular basis! Redmond Senior Center utilizes a great staff of warm, friendly volunteers in many areas: nutrition, reception, programming and much more. Openings change as the life events of their volunteers fluctuate. If you are looking for a fun and interesting place to make a difference, check out the Redmond Senior Center. Hours and shifts vary. Shoreline Public Schools – Power of One Senior Volunteers: Give back and help a child. They’re seeking volunteers to connect with children in a positive way in the Shoreline Public School District! Volunteers provide consistent help in a range of areas – from working with students in small groups and one-on-one tutoring to classroom tasks and library skills. AARP Fraud Fighter Call Center: Help the elderly recognize, refuse and report fraud. Volunteer responsibilities primarily include telephone tasks and administrative assistance. Volunteers call individuals with fraud prevention information and provide victim assistance through referrals and resources to those who have experienced fraud. Clerical support and data entry is also needed for ongoing projects. Cancer Resource Centers: American Cancer Society seeks volunteers for their Cancer Resource Centers at Highline Cancer Center and Valley Medical Center. Make a difference in the lives of those fighting cancer; help save lives by fulfilling yours! Assist patients in finding resources directly in the hospitals where they are being treated, and link them to support services and community resources. Training is provided, so no prior experience is required. Road to Recovery seeks volunteers for this essential program. Join a group of volunteers who drive cancer patients to and from medical facilities for life-saving treatments. The schedules are flexible. If you have a car and can spare as little as one morning or afternoon a month to help somebody along the Road to Recovery, they would welcome your help. Auburn Community Food Bank: Lend a hand and help others access food. The Auburn Food Bank is a volunteer-directed organization that provides food, referrals and emergency assistance to those in need. Volunteer opportunities include: ⇒counter person, ⇒door person, ⇒bagger, ⇒vegetable/bread attendant, and ⇒van helper (assist with loading and unloading food donations). City of Renton: Serve as a volunteer at the Information Desk at Renton City Hall. Volunteering at the lobby desk provides a great opportunity to learn more about municipal government, city operations and community issues in a relaxed environment with lots of people contact while providing a valuable service to the city and the community. Volunteer tasks include: ⇒answer phones, ⇒greet and direct visitors to City Hall offices and meetings, ⇒provide information and referral services to the public, and ⇒assist with small projects. Communities in Schools of Renton: Become a mentor – you can make a difference in the life of a child! There are many students waiting for a mentor who need your help. Provide encouragement, guidance, fun and friendship to a child in weekly one hour sessions (during the school day, on school grounds). By sharing life experiences, hobbies and playing games, you bring support, consistency and stability to a child’s life. Training is provided. Franciscan Hospice & Palliative Care (FHPC): Affirming every life, FHPC invites you to join them as a volunteer, enhancing the compassionate care they provide to patients and families. Volunteers make home visits to see patients. Be part of a team of professionals and volunteers to discover and meet the unique needs of hospice patients and their families, providing them with both practical companionship and emotional support. Full Life Care – Adult Day Health Care (in Renton, Kent & Columbia City). Jewish Family Service: Family mentor volunteers are needed in Kent! Help newly arrived refugees become acquainted with their surrounding communities and face the challenges of resettling in a new country. Volunteers will meet with an individual or family for an average of 2-3 hours per week for three months to help them navigate the crucial facets of American life including transportation, banking, ESL skills, job search process, and health and child care information. Kent Senior Activity Center: Join this group of dedicated volunteers to provide programs, services and activities to encourage the independence and involvement of older adults in the community. Whether you volunteer on a regular basis or only for special occasions, the Center needs you to help keep their programs successful and running smoothly. Volunteers are needed to fill various regular or substitute positions. Experience life and give volunteering a try! Multi-Service Center: Volunteer opportunities: ⇒help adults complete their GED, ⇒help students learn English as a Second Language to improve their reading and speaking skills, ⇒help students improve basic reading, writing and math skills, or ⇒help sort food and clothes in the Food and Clothing Bank. Three-hour-a-week commitment (two shifts of 1.5 hours) for a minimum of six months requested; no teaching experience required. Pacific Algona Senior Center: The Center is growing and needs your assistance. They are seeking volunteers in many areas. Come and share your expertise and passion! Volunteer opportunities include: ⇒meal services preparation, ⇒serving and cleanup, ⇒office administrative assistance, ⇒arts and crafts, ⇒special events, and ⇒gardening. Port of Seattle: Do you love to travel and enjoy being in airports? Join a dynamic group of volunteers to assist travelers at Sea-Tac Airport. Help travelers find their way around the airport, give out information about the Seattle-Tacoma-Everett area, or provide service to those in distress or needing assistance in changing planes. Solid Ground: Sponsor of RSVP in King County, Solid Ground works to end poverty and undo racism and other oppressions that are root causes of poverty by providing housing, food, transportation and other services to those in need across King County. Volunteer positions are open in many of the programs we administer. These include: ⇒nutrition education, ⇒tutoring, ⇒helping at a community farm and ⇒supporting outreach efforts. Senior Meals Volunteers help in the community dining programs to: ⇒prepare and set tables for lunch, ⇒assist in food preparation, ⇒serve lunch to guests, and ⇒clear dishes/assist with clean up. Tukwila Pantry: Volunteers are needed to assist in the food bank with distribution day preparation and on distribution days. Volunteers are also always welcomed to assist with weekly tasks associated in serving up to 100 people at Tuesday’s Table – Free Community Dinner Meal. Distribution prep tasks: ⇒unloading the food truck, ⇒bagging bulk and other foods, ⇒preparing shopping carts, and ⇒setting up the bread station. Distribution day tasks: ⇒data entry, ⇒customer service, ⇒monitoring lines and stations, ⇒restocking items and ⇒cleaning up. We strive to make volunteering easy and rewarding by finding meaningful volunteer positions and providing ongoing support during your volunteer service. Membership in a national service organization: With RSVP, your volunteer hours are counted as a part of a national movement. Personal attention from RSVP staff: We can help you find volunteer opportunities suited to your desires and needs. Supplemental insurance: Extra coverage while you volunteer. Experience in Action (EIA) subscription: RSVP’s popular newsletter highlights volunteer service in your community. Annual volunteer recognition: To acknowledge your contributions to the community. Ounce of prevention… pound of cure! Caring for one another as we age! Learning on a roll for fall! Please contact Jan Hancock, RSVP Program Coordinator, for information on becoming an RSVP volunteer. Please contact Jennifer Gahagan, Volunteer Services Manager, for more information on how to become an RSVP site partner.